I don’t often can with Rainier cherries because they are fragile and expensive (and truly, I love eating them without any embellishments). However, I managed to get out to Rowand’s Farm in New Jersey this year while there were still some in the trees and picked enough that I felt okay about surrendering a few pounds to the canning pot. 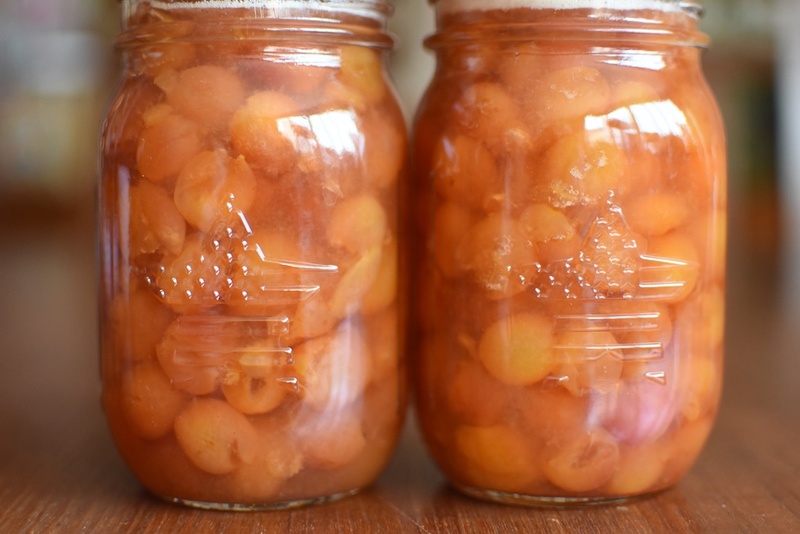 The preservation technique for these cherries is similar to the one I use for the bourbon sour cherries I posted yesterday. The cherries are pitted and macerated with sugar. Once they’re juicy, you scrape them into a pot, add the lemon juice, and bring them to a boil. They cook for just five or six minutes. This is long enough for the cherries to soften a bit, release the bulk of their internal air (so that they don’t float), and for the syrup to thicken a little. Once you determine that the cooking process has gone as long as is necessary, you add the almond extract so that the flavor doesn’t have time to evaporate (to make these even more closer to the sour cherries, you could use amaretto in place the extract). Then they are ladled into jars, lidded, and processed in a boiling water bath canner. These are a treat spooned into oatmeal in the wintertime or portioned out over slices of poundcake. Prepare a boiling water bath canner and enough jars to hold five half pints (the yield will be somewhere between 4 and 5 half pints). 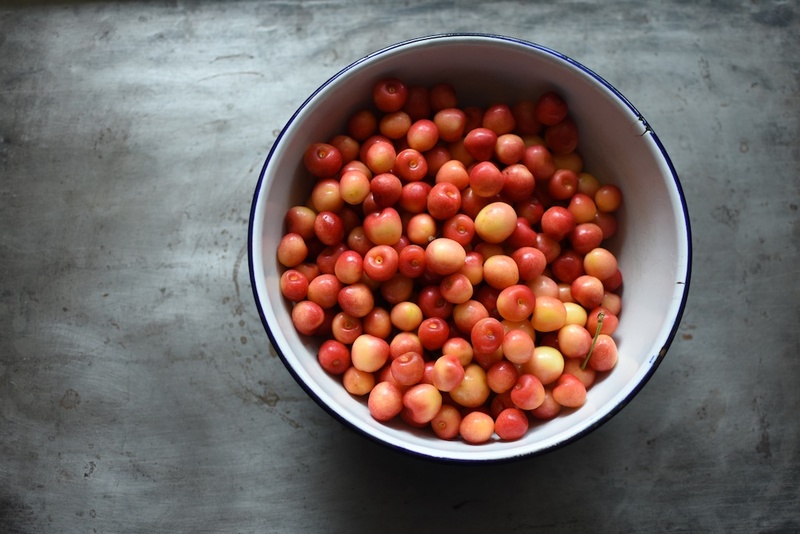 Place the pitted cherries in a pan that holds at least five quarts (these cherries will foam a lot) and add the sugar and lemon juice. Stir to help the sugar dissolve. Once the contents of the pan look juicy, place it on the stove over high heat. 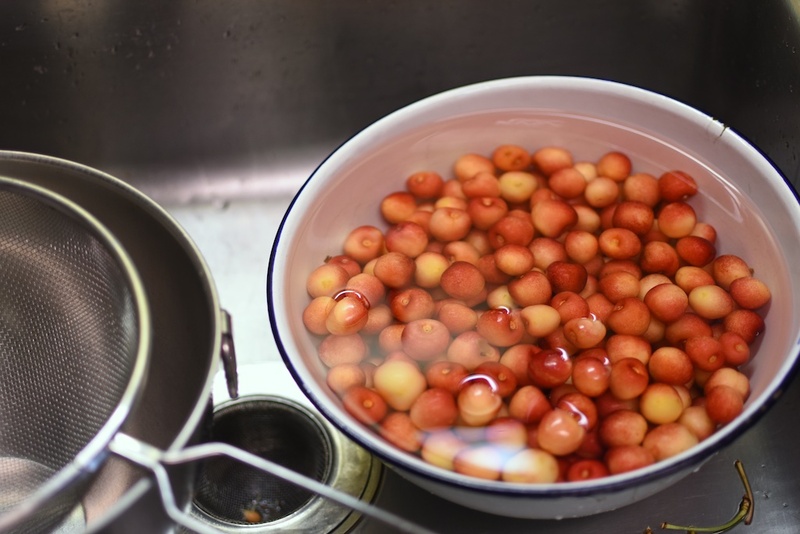 Bring the cherries and their liquid to a boil and let them cook at a good clip for 5 to 6 minutes, until cherries soften a little and the liquid in the pan as thickened a bit. Add the almond extract. 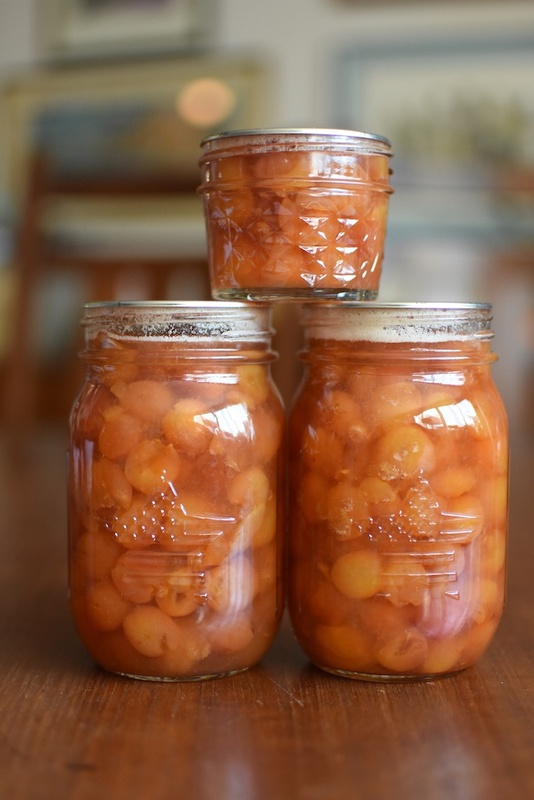 Remove pan from heat, funnel cherries and syrup into prepared jars, leaving 1/2 inch headspace. Use a wooden chopstick to remove any trapped air bubbles and adjust the headspace as is necessary. Wipe the rims, apply the lids and rings, and process in a boiling water bath for 10 minutes. Sounds delicious! Where did you get the jars with the stars on them? Ball Stars and Stripes jars. These cherries look so beautiful in the jars, Marisa. They kind of look like golden raspberries.